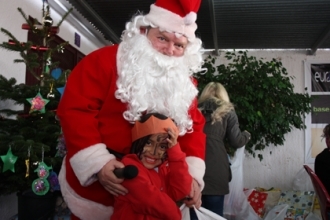 BAY RADIO’S seventh annual Christmas Party for the youngsters of the Preventorio de Gandia was once again a packed afternoon of festive fun. From the moment nearly 50 children flood into tinseltown – Javea’s football ground – to the moment they left on Tuesday the air was crackling with excitement. The Javea-based radio station asks its listeners to chip in with donations and presents for the children cared for by a handful of nuns and volunteers in Gandia and a similar establishment in Elche, and every year the public generously responds. The logistics of Operation Christmas Party are quite impressive. A team of 12 volunteers – many from the Javea International Baptist Church – took four days to wrap the gifts. They used around 110 metres of festive wrapping paper, 50 metres of wrap kindly donated by Quicksave Javea. And on the big day the children and carers are bussed down to Javea for an action packed day, with a slap-up meal filled with favourites like chocolate and crisps…and the odd sensible morsel. They also take the opportunity to test out two bouncy castles, the football field – Sister Amelia can be very competitive – face painting and jewellery making. There was also magical entertainment provided by a clown. The highlight of the party was once again the arrival of Father Christmas who handed each of nearly 50 young and impressively polite guests plastic sacks stuffed with presents. He said the appeal helped provide something for the little ones who were the future. “It is a real reason to have faith in people and it does not matter who you are, when you see the kids go up and get presents from Father Christmas you see how much they appreciate it rather than take things for granted.